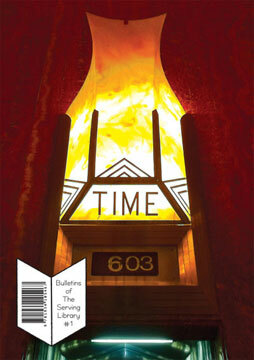 The “bulletins” that make up each issue will be first published online as PDFs at www.servinglibrary.org over a six-month period, then assembled, printed and distributed separately in Europe (by Sternberg Press with Motto Distribution) and in the U.S.A. (by Dexter Sinister). Each collection will constitute a semester's worth of loosely-themed material. For this PILOT issue, we’ve posted PDFs, bound and printed the publication over the first six months of 2011 in advance of launching. From now on, bulletins will be posted to this website as they are ready. If you’d like to be told when they’re up, you can join our mailing list Open-Reading-Group. We begin with a plea to remember dead media by Bruce Sterling; an 8-part examination of the Octopus Vulgaris as a metaphor for post-symbolic communication (whatever that might mean) by Angie Keefer; a zero-sum conversation about Libraries and Recording by David Reinfurt & Rob Giampietro; and separate notes on the Type and the Time by Dexter Sinister. The Serving Library’s broader intentions can be found at the back in the smallprint.